Next QB? : Are Chargers Contemplating a Successor to Rivers? 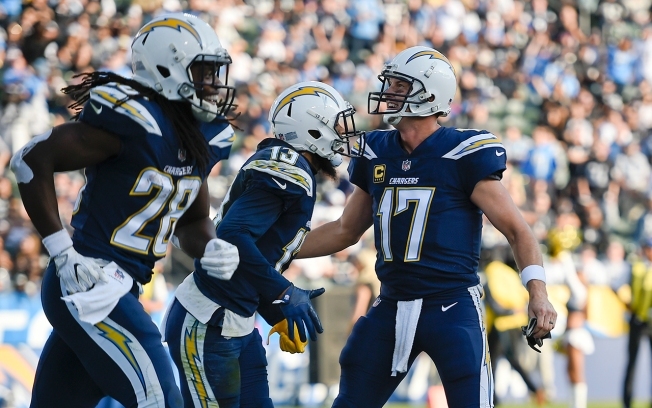 Los Angeles Chargers quarterback Philip Rivers, right, celebrates with wide receiver Keenan Allen, center, and running back Melvin Gordon (28) after a touchdown by Allen during the first half of an NFL football game against the Oakland Raiders, Sunday, Dec. 31, 2017, in Carson, Calif.
All the buzz this offseason has been around the two So-Cal quarterbacks, but the question still lingers: Who will go first? Josh Rosen or Sam Darnold? AM 570 LA Sports’ Kevin Figgers says Darnold should go first overall but KFI’s Shannon Farren tells Mario Solis that Cleveland's poor history could impact the former USC quarterback. Originally Aired on Going Roggin on April 22, 2018. "That's a question we know we'll get every year until we draft a quarterback," Telesco said Monday. Where Will Josh Rosen Get Drafted? If Sam Darnold goes to Cleveland, who will draft UCLA quarterback Josh Rosen? 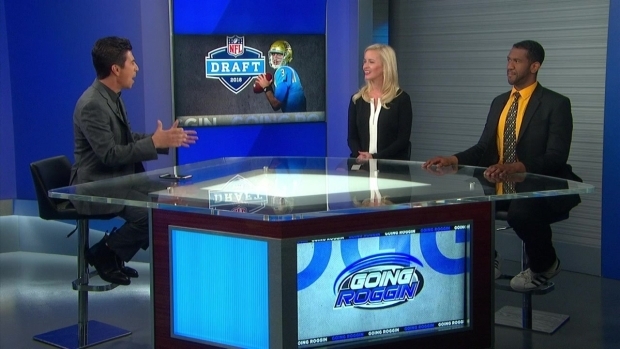 There may be concerns about his off-the-field antics, but KFI’s Shannon Farren argues that shouldn’t be a factor for NFL scouts, and AM 570 LA Sports’ Kevin Figgers tells Mario Solis that Rosen will be a top five pick. Originally Aired on Going Roggin on April 22, 2018. If that's a clue to the Chargers' intentions, they have plenty of needs, including a topflight safety to replace Tre Boston or a starting linebacker to help out Denzel Perryman.